Xytronic Industries LF-853D 3 in One Multi-Function S.M.D. Desoldering Rework Station with out the TWZ100 or HAP80. 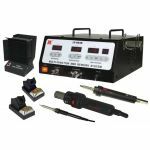 This Xytronic LF-853D 3 in 1 desoldering station combines soldering, desoldering, and hot air functions into one comprehensive, space saving unit comprising 100W soldering iron, 100W desoldering iron and a 600W hot air wand. A range of accessories, comsumables and spares are available to keep the station in peak condition. Choose a Xytronic LF-853D Self-Contained Desoldering Station Today.